There are currently more than 2,000 transitional housing beds in San Diego County for homeless families and single adults. However, an article published last month by Kelly Davis of the San Diego CityBeat reported transitional housing’s shortcomings. According to CityBeat, HUD recently announced that transitional “programs should aim to move 80 percent of their clients into permanent housing.” If programs don’t meet this goal, their funding might be reduced and region-wide homelessness funding could be jeopardized. To read the full CityBeat article, click here. In the past month our most vulnerable populations have faced innumerable challenges in the wake of federal actions. Though legislators have bandaged the budget gridlock, the damage has been done for many individuals, and there is no guarantee that a resolution to Congressional embroilment will happen before the next deadline. In California, however, crucial decisions have been made by Governor Brown on game-changing legislation. Many measures that will alleviate homelessness were signed into law, and we are pleased to announce the positive outcome of key bills we have been tracking. Our own Campaign to End Homelessness in Downtown San Diego is likewise seeing valuable momentum, and, as always, we look forward to keeping you up to date on the latest news and policy developments surrounding our efforts. The government shutdown has ended, but this disaster may have a sequel. Lawmakers approved a budget that will let the Treasury Department pay the bills until the February 7th debt ceiling deadline, but if further agreements aren’t reached by January 15, another shutdown will commence. Although Congress is adamantly asserting that they will prevent this outcome, few solutions have been brought to the table. 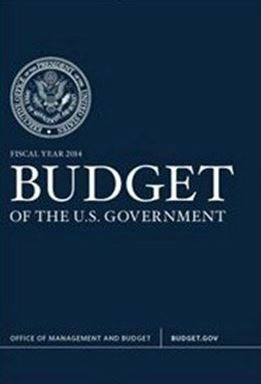 The cost of the shutdown is still being debated, but it is estimated to be in the billions. The cost of placing important support networks at risk, however, may be harder to tally. Local programs that rely on federal funding to help the homeless had to shut down orfind new ways to pay rent fees; the U.S. Department of Housing and Urban Development abruptly stopped processing paperwork, keeping people from moving into supportive housing; and the Department of Veterans Affairs struggled to keep up with backdated disability claims. For these already fiscally-stressed networks, a continued pattern of shutdown threats will lead to insecurity for many vulnerable beneficiaries. With the extensive media attention on Healthcare.gov, many are wondering if the arduous process is worth navigating. The National Health Care for the Homeless Council has developed factsheets, toolkits, and other enrollment materials to help providers encourage people experiencing homelessness to apply. The United States Interagency Council on Homelessness (USICH) has also outlined the benefits of the Medicaid expansion for the homeless, and recently posted an open letter to Continuum of Cares and Ten-Year Plan Leaders on how to leverage the Affordable Care Act in ending homelessness efforts. Please be sure to utilize these tools to help promote registration for those who are most in need. Last month we provided a deep analysis of the Campaign’s performance metrics and housing outcomes to understand the progress and anticipate next steps toward ending homelessness regionally and nationally. We looked forward to Registry Week in North County, considered lessons learned from the National Alliance to End Homelessness Conference, overviewed critical legislation at the federal and state levels, and recapped President Obama’s focus on veteran homelessness here in San Diego County. At our September Leadership Team meeting, we held a workshop to chart the course for ending homelessness in Downtown San Diego through 2014. We will continue to create goals and action items in upcoming Leadership Team meetings. In this month’s newsletter we recognize momentum in the work of local agents and innovators, and track opportunities that State and Federal legislation may bring. We celebrate Kelly Knight of DSDP for her homeless outreach efforts; learn about the trendsetting program that one USD grad student has developed to feed the homeless; look to key upcoming regional events; and clue you in to the way SAMHA and others will be maximizing use of the Affordable Care Act. We look forward to keeping you up to date on the latest news and policy developments in efforts to end homelessness. In July, the Campaign achieved major milestones and significant progress in ending homelessness by celebrating the 3 year anniversary of our Leadership Team, and becoming a member of the 100,000 Homes Campaign 2.5% Club. The 100,000 Homes Campaign has released an inspiring video about progress in ending veteran homelessness that features several veterans identified during Downtown San Diego’s Registry Week and housed through the Campaign and VA’s efforts. This month, we have focused on a deep analysis of the Campaign’s performance metrics and housing outcomes. We also look at next steps for ending homelessness regionally and nationally, through Registry Week planning in North County, lessons learned from the National Alliance to End Homelessness Conference, an overview of critical legislation at the federal and state levels, and a recap of President Obama’s focus on veteran homelessness. We look forward to keeping you up-to-date on the latest news and policy developments in efforts to end homelessness here in San Diego County. Earlier this year, staff at LeSar Development Consultants (LDC), the Campaign Coordinator, provided a first-glance report on Campaign performance metrics, promising to come back each quarter with a deeper dive into the Campaign data analysis. On August 15, the LDC team presented the “Quarterly Performance Metrics Report as of Quarters 1 and 2, 2013” to the Campaign Leadership Team, taking a closer look at the housing outcomes of Phase 2 (Blitz Week), and overall retention rates based on length of time in permanent housing. 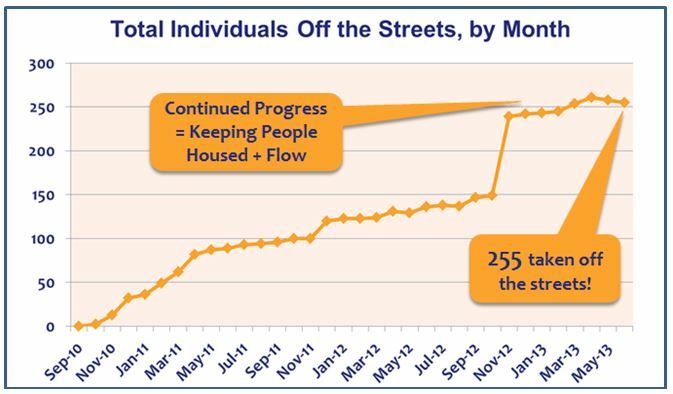 This first graph is a visual representation of the Campaign’s progress over time, showing the monthly tally of clients housed through the Phase 1 and Phase 2 efforts since the Campaign’s initiation with Registry Week in 2010. The sharp uptick in November 2012 represents the success of Blitz Week, when Campaign partners successfully housed 86 people in 3 days. Since Blitz Week, Campaign partners have continued to make significant progress by keeping people housed, sustaining resources and maintaining program flow by housing new people as units and vouchers became available. As of June 2013, the Campaign exceeded its goal of housing 225 individuals, with a total of 255 homeless persons taken off the streets! The above pie charts compare the housing outcomes of all clients permanently housed on a voucher through Campaign efforts during Phase 1 and Phase 2. As indicated on the graph, clients have left permanent housing for a variety of reasons, including “noncompliance with housing or services” wherein an individual repeatedly refused to participate in the case management services paired with their housing voucher. We will continue to explore these housing exits in future reports. Most significantly however, the graphs also show that 85% of clients permanently housed in Phase 1 had successful housing outcomes, and 91% of clients permanently housed in Phase 2 have had successful housing outcomes! 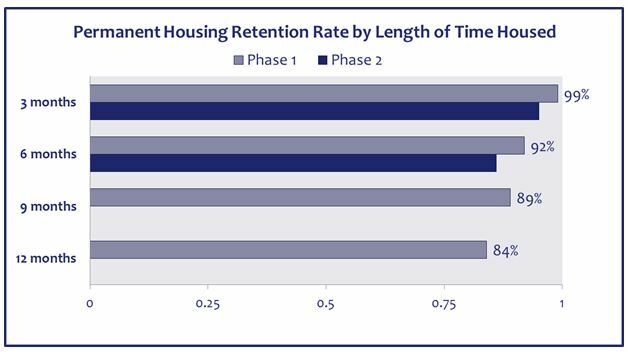 This chart looks at the retention rate of individuals in permanent housing based on length of time. The percentages indicate how many people were still housed after three, six, nine and twelve months. It should be noted that Phase 2 (Blitz Week) clients began to have access to their housing vouchers in January 2013, therefore only 6 months of data is available at this time for Phase 2. As reported by the U.S. Department of Housing and Urban Development (HUD) and the Corporation for Supportive Housing (CSH), approximately 75-85% of those who enter permanent supportive housing are still housed after one year. Based on our Phase 1 retention rate of 84% after 1 year, the Campaign is at the higher end of national averages! We will provide additional Phase 2 retention rate analysis as well as further outcomes analysis in the next Quarterly Metrics Report! To learn more about our work, be sure to check out the 2012 Annual Report for the Campaign to End Homelessness in Downtown San Diego. This report was graciously created by Oliver McMillan and Burritt Design. The beginning of summer has been very exciting. Local and regional partners were honored at the San Diego Housing Federation’s Ruby Awards as well as the Behavioral Health Recognition Dinner. Also, new communities from across the country joined the 100,000 Homes Campaign and participated in the Campaign’s Registry Week Boot Camp in Los Angeles. 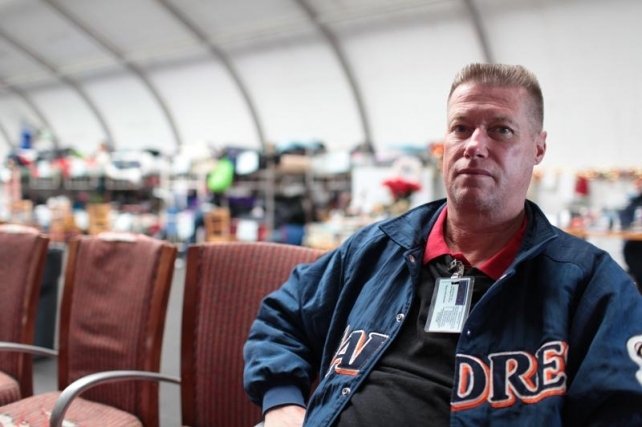 In addition to these stories, read below for a special interview with Zach Olmstead, former Homeless Policy Director for Housing California, who joined the Office of Assembly Majority Leader Toni Atkins on June 24 to focus on housing and homelessness issues. We have broadened the focus of our monthly Homelessness Update. Going forward, we will provide information on local and regional happenings, an overview of state and national progress including updates on important homelessness legislation and budget items, and look closer at best practices across the country. This past Memorial Day, we remembered and honored the men and women who died while serving in the United States Armed Forces. We continue with our commitment to help the hundreds of veterans who are struggling with homelessness in our community. Mayor Filner has requested significant funding to extend the Veterans Winter Shelter year-round, and is working on a comprehensive plan to end veterans homelessness in the city. However, there is more work to be done in ending veteran homelessness. The results of the 2013 Point-in-Time Count showed that roughly 15% of the 8,879 homeless individuals counted in the San Diego Region are veterans – this equates to approximately 1,330 homeless veterans in the region! We will continue to highlight best efforts and practices to end homelessness for our veterans and other persons residing on the streets in San Diego. Thank you for your continued support and involvement in the Campaign. This website is managed by LeSar Development Consultants, the coordinator of The Campaign to End Homelessness in Downtown San Diego.